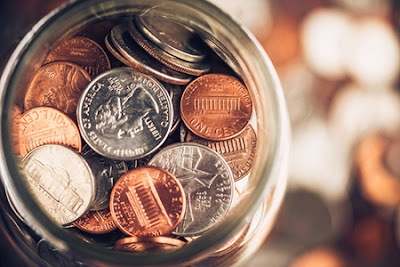 • Automatic transfers from your checking account to your savings account can help make the process mandatory—and maybe a little less painful. • The $5 bill savings plan. Every time you receive a $5 bill as change, set it aside. It took her 12 years, but one woman claims to have saved $36,000 with this little trick. • Set aside raises, bonuses, and tax refunds. It’s tempting to spend them, but think of the excitement of moving into your own home. • Keep the change. At least a couple of banks have variations on this theme. For example, Bank of America allows debit card users to sign up for a service that rounds up purchases to the nearest dollar and puts the change into a linked savings account. • Use cash rewards credit cards. Get the cash back from purchases you make and put the rebates into savings. • Snag a few bucks here and there. Checking account balance a few bucks over a round number? Take the extra and transfer it to savings. • Keep the car and save the payment. Paid off your car? Resist the urge to buy a new one and save the monthly payment instead. • Start fast and momentum will build. Seed your down payment fund with a birthday check or other little windfall. A quick start might motivate you to see the balance build. • Visualize your goal. Put big, beautiful photos of your dream house on the refrigerator or in your office workspace—and wrap a small one around the primary credit card in your wallet. You might trick yourself into charging less and saving more. • Use an app to track progress. Using budgeting tools like Mint, SavedPlus, Dollarbird or others may provide even more incentive to save.